The shot heard round the O-Dome was the start of the Gators needed spark. 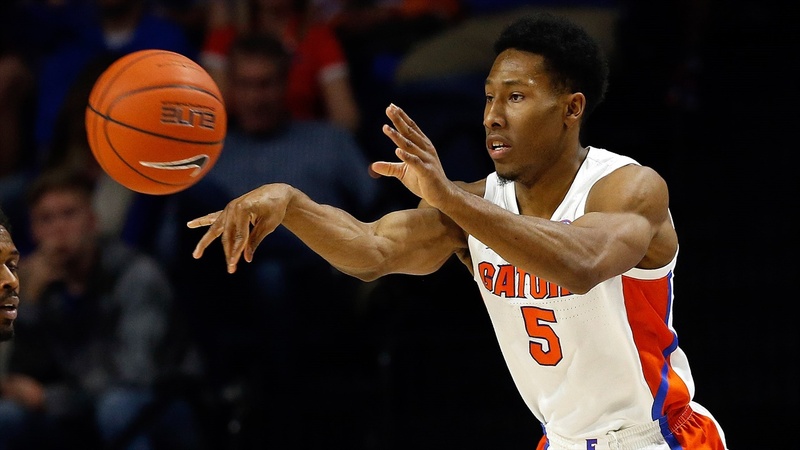 For the Florida Gators to defeat the Ole Miss Rebels 90-86 in overtime on Wednesday night, it would take every shot, every rebound and every bit of defensive effort to pull of the win. But there’s one moment that will deservedly stand out from the performance. With 1:01 to go in regulation, Ole Miss sent KJ Buffen to the free throw line where he hit two in a row for a three-point lead. A jumper on the other end by Gators standout freshman Andrew Nembhard made it a one-point deficit. But then two more shots from the charity stripe by the Rebs left it a three-point game with 0:08 seconds to go. Florida called a timeout and dialed up their Hail Mary. In the huddle, head coach Mike White called for a quick two. At the last second though, he made a change. Go for the three, with either KeVaughn Allen or Noah Locke taking the shot. There were 2.5 seconds left on the clock by the time the ball swished through the net. KeVaughn Allen had already turned with a smile on his face to head back up the court. Ole Miss threw in a long inbounds pass that Allen stole and the Gators officially headed to overtime. “He hasn’t always been that confident,” said White of the moment. But on Wednesday night he had all the confidence he needed to make a do-or-die shot and it was the spark his team needed. “It gave us a lot of spark because we knew that him making that shot, it was time for us to really turn it up,” explained freshman Noah Locke, who led the team with 22 points. Once in the extra period, Allen didn’t stop, dishing an assist to Locke for a 3 that got things going and notching two more baskets of his own (he also went 8-8 on the night from the free throw line). But once again, there was one moment that stood out, proving a turning point at a crucial time. The entire possession was a clinic in hustle and sticking with a play. With less than a minute to go and hanging on to a one-possession lead, the Gators needed that spark from Allen again. He missed a jumper and was falling towards the base line when Jalen Hudson popped out the offensive rebound. Then on super hero night on the O-Dome, Allen à la Patric Young against Tennessee. He knocked it back to Hayes who got it to Andrew Nembhard. The freshman drew a foul and knocked down both from the line. The Gators five point lead they needed to close this one out. “I saw the ball just bouncing but then in my head I thought of coach’s message, just make winning plays, so I just dove on the ground then like I saw Spidey [Hayes] out the corner of my eye and tipped it to him,” relied Allen. The moment included more than just Allen though; on a team that has developed an identity this season with its freshmen, it was the veterans that White credits with keeping the Gators hopes alive at the end of the game. Keyontae Johnson said they would be allowed one hour to relish the win. Then it’s on to bigger tasks, like a date at home this Saturday with No. 7 Kentucky. And while they won’t be dwelling on this win any longer, they’re hoping it’s effect—and the magic of Allen’s moments—will be linger.